Creta is sold as the ‘ix25’ in China. Next-gen SUV borrows design cues from the flagship Palisade. In what’s come as a pleasant surprise, Hyundai has taken the wraps off of the next-generation Creta. 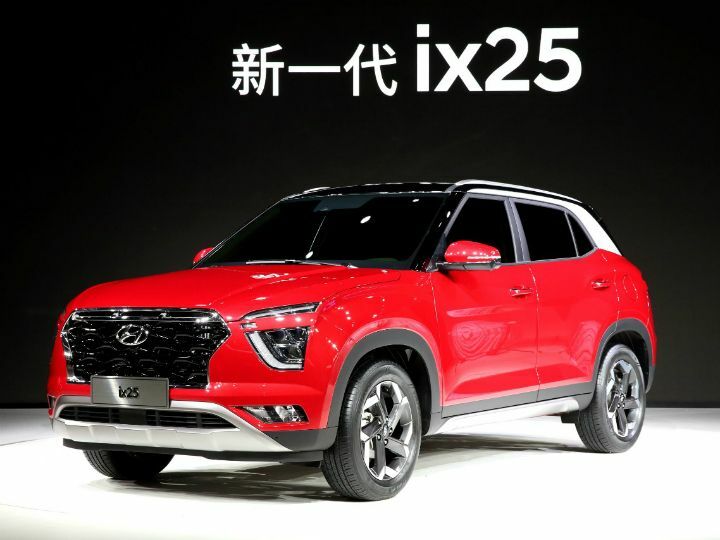 The small SUV debuted at the 2019 Auto Shanghai expo in China wearing the ‘ix25’ badge. The Chinese-spec ix25 and India-spec Creta have been near identical in terms of features and design. So, it’s safe to assume what you see on your screen right now, is what you’ll see on Indian roads next year. As far as design goes, Hyundai has brought the Creta in line with the new SUV design theme that was kicked off by the Palisade. This includes a different interpretation of the signature grille, and headlamps placed on the bumper. Also, much like the range-topping Palisade the daytime running lamps are split into two sections in an C-shaped formation. At the rear too, you’ll spot split lamps. And that’s not the only interesting element there. The massive red strip running across the length of the tailgate is in fact the tail lamp! It remains to be seen if this is toned down for the Indian market. At Auto Shanghai, the ix25 was finished in a unique triple-tone colour scheme with a red base, silver-finished C-pillar and a blacked-out roof. We’d love to see this in the India-spec Creta too! Step inside the Creta 2020, and it’s clear that Hyundai wants to up the ante here. The car on the show floor sported an off-white black interior theme, which could very well make its way to India. In terms of design, it’s easy to spot some Tesla influence here, thanks to the super large central screen that flows into the lower half of the dash. There are no physical controls for the climate control - it’s all moved to a touch-based interface. We also spot a new steering wheel that we’d get in the upcoming Hyundai Venue. Smaller details include an electric parking brake, an auto-hold function as well as paddle shifters. There’s a small ‘Terrain Mode’ dial as well, which hints towards the possibility of ESP-based drive modes (just like the Tata Harrier). At the moment, it’s unclear what engines Hyundai will choose for the India-spec Creta 2020. It’s likely to be a pair of brand new BSVI-compliant 1.5-litre petrol and diesel engines which are expected to be shared with the Kia SP2i and the updated Hyundai Verna that debuts next year. We’re expecting Hyundai to showcase the new SUV at the 2020 Auto Expo. It’s safe to expect the five-seater version to go on sale first, followed by the seven-seater version. With the update, we’re expecting prices to go northward. The next-gen Hyundai Creta is likely to be priced between Rs 10 lakh - Rs 16 lakh (ex-showroom). At that price, it will battle the likes of the Tata Harrier, MG Hector, and the Kia SP2i.